We are straddling seasons—one toe in winter, both hands white knuckled grasping tenaciously and struggling feverishly to hang on to any shred of a memory of summer. Or is that just me? So here’s a soup that bridges the seasonal gap. I live by turning lemons into lemonade—but not literally. I don’t drink sweetened drinks. But if I buy a basket of peaches and they taste a little woolly, I try to hold my temper and come up with recipes that mask the imperfection. 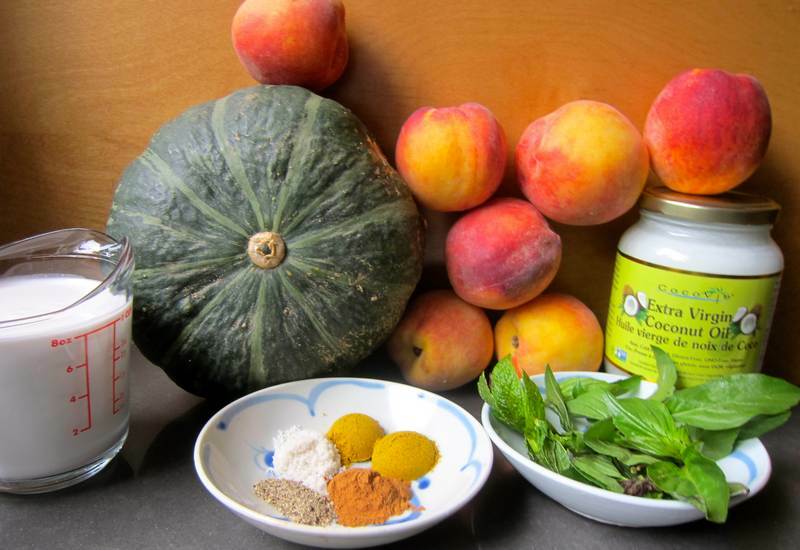 Hence Ginger Peach Chutney and Curried Peach Squash Soup. At this rate I’m starting to relish imperfection. Blend until smooth and serve hot, garnished with cilantro and grilled peach slices. Serves 6-8. 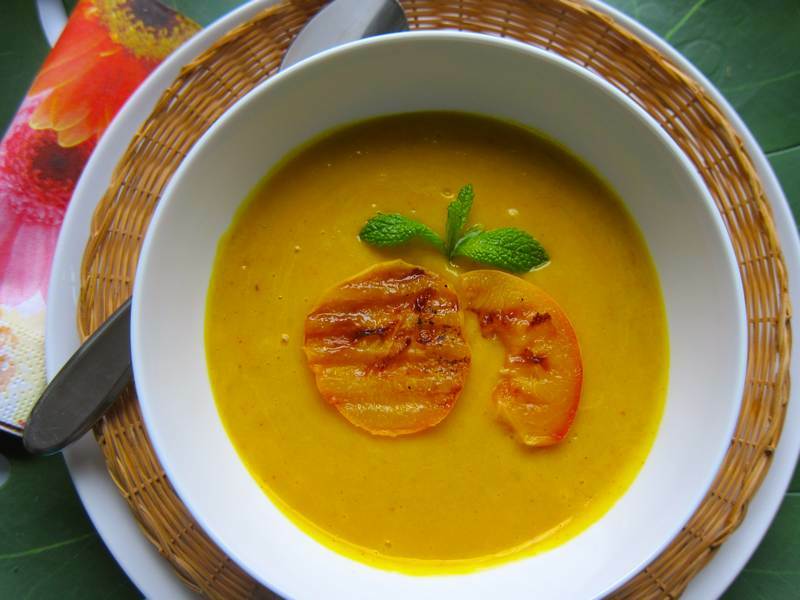 Curried Peach Squash Soup simply screams Thanksgiving. There are 14 Jittery Cook Squash Recipes. How many have you tried? Planning a trip to Vietnam any time soon? Read the Ultimate Food Guide and the Kwintessential guide to language culture, customs and etiquette. Looking for 5 easy umami boosters from Momofuku Culinary Lab? Finally watched The Company You Keep, and it brought back memories of anti-Vietnam war protests inevitable comparisons to apathy surrounding ongoing wars. Did you catch the Bill Maher rant on USA foreign policy? Are you surviving Whole Foods? Love this article listing 10 simple science-backed ways to make yourself happier today. They say we should eat highly coloured foods. How well do you see colours? Your presentation on your soup is really beautiful! Thanks Allison. Like I always say, it tasted as good as it looked. Healthy too! Well said! I love those kinds of flavors too!